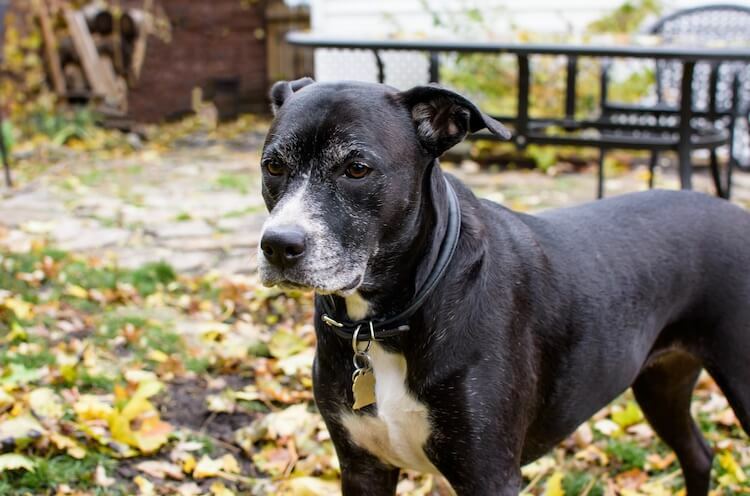 The Boxer Lab Mix, nicknamed the “Boxador”, is the perfect family dog. Kind, loyal and protective, these active dogs are the life and soul of any dog-party. Best suited for families who live an active lifestyle, this overgrown puppy will be your best companion on all kinds of adventures. 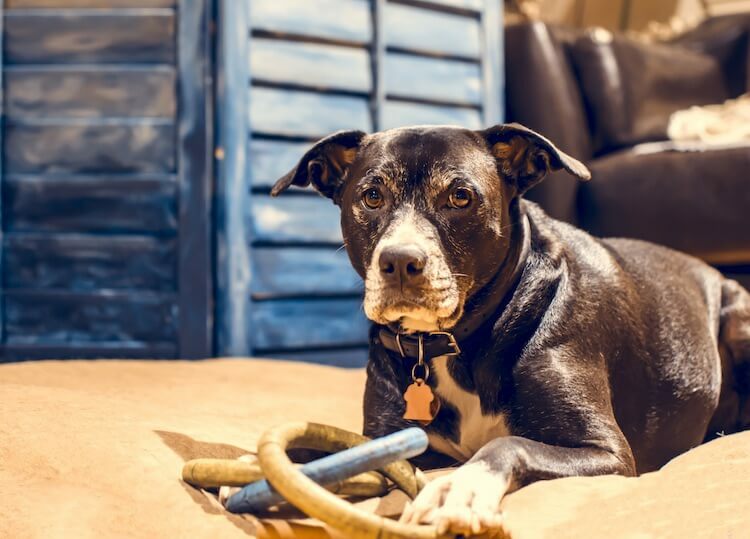 You may have seen this famous Boxador on Instagram, but what is there to know about this adorable, albeit mysterious, mixed dog breed? Read on to find out. Free Giveaway: Learn More About Boxadors By Downloading Our Free Owner’s Guide. This mixed breed is a relatively new designer cross breed whose origins aren’t clear. A Boxador is cross breed between a Labrador Retriever and a Boxer (both purebred dog breeds) and sibling to the Borador. The resulting designer mix is a dog known for its intelligence and devotion. A Boxador’s lifespan, on average, ranges from between 12 and 15 years of age. However, there is some variation in how long they live, with some owners reporting them to live to be 15 years of age. Typically they cost between $350 and $800 USD. Being a larger dog, a dam’s litter is usually between 4 and 8 puppies. The fact that their litters are on the smaller size, and that the breed is in relatively low demand, makes them difficult to source; especially from a reputable breeder. However, they are a common dog to find in shelters, therefore you might want to look into adopting one. A Boxador’s Brindle color comes from their Boxer parent (left). In order to understand the Boxador’s temperament, it is important to first understand its purebred parents. Boxers, whose name comes from a tendency to stand on their hind legs and “box” with their front, are playful dogs who are good with children and families. A descendent of the German Bullenbiesser, originally bred for hunting, are tasked to seize the prey and then hold it until the hunters arrive. The boxer was bred from this to be smaller and faster. In 1904 the first boxer was registered with the Kennel Club. Labradors were bred as gundogs from Newfoundland. Kind, loving and outgoing, they are the perfect choice for anyone from all walks of life. Due to their considerate nature and passion for learning, they are the prime choice for service dogs. Unsurprisingly, these qualities make them one of the most popular dogs in the UK and the USA. They have been the most popular dog in America for 26 consecutive years. As a result of their protectiveness, typically from the Boxer parent, they make wonderful guard dogs. If you have a preference for one parental characteristic, over another, it is possible to encourage this behaviour through positive reinforcement. Due to their large size and bouncy nature it is important to supervise contact with younger children to avoid any accidents. However, these dogs make wonderful family pets for families with older children. Active and fun, they love to be part of what is happening within any family home. These dogs do not like to be left for long periods of time and can grow bored quickly. Therefore, this dog may not be for you if you spend long periods of time away from the house or do not have the time to spend exercising your dog. Neither boxers nor labs are prone to barking or howling so you shouldn’t expect much noise from your dog. However, they may bark out of fear as the boxer’s protective nature will compel him to protect you. With time and patience your dog will soon realise there is no threat to them or to you. As well as this, the influence of the Labrador may result in the perceived intruder being licked to death! The Boxer Lab Mix has high energy requirements and consequently needs an owner who can keep up. Therefore, this dog is best suited to someone who loves the outdoors just as much as their pet. As a result of their loyal temperament, they make a wonderful family dog. Their family friendliness means that the whole family can help with exercise and going out on long walks together. Boxadors love to eat, like their Labrador parent! This hungry dog can eat his way through a lot of food, so it’s very important to watch their diet. Four to five cups of dry kibble spaced over two even servings a day is ideal; you can throw in some tasty snacks too. Be mindful of the speed a Lab Boxer Mix eats, because if they eat too much food too quickly, they can bloat. We recommend splitting their food into a morning and evening meal which spaces their food evenly throughout the day. Boxadors do well on both dry and canned food but it’s important to watch their weight and regulate their food intake accordingly. Some Labradors are allergic to grains so it is important to pick a high quality, grain free food for your Boxer Lab Mix. We recommend a high protein diet for your mix to help keep your dog’s coat shiny and sleek and their muscles fit and strong. As a rough guideline, theirdiet should be a minimum of 20% protein and 15% fat. Due to their large size, boxadors need at least one hour of exercise a day. These dogs are not lap dogs, they love to be active, channelling their roots as gun dogs by running through fields and following sent trails. A quick run around the garden will not be enough exercise for these dogs. Outdoor yard play may supplement this exercise requirement somewhat. However, you will find that when your dog is well walked, the physiological and psychological benefits will show. 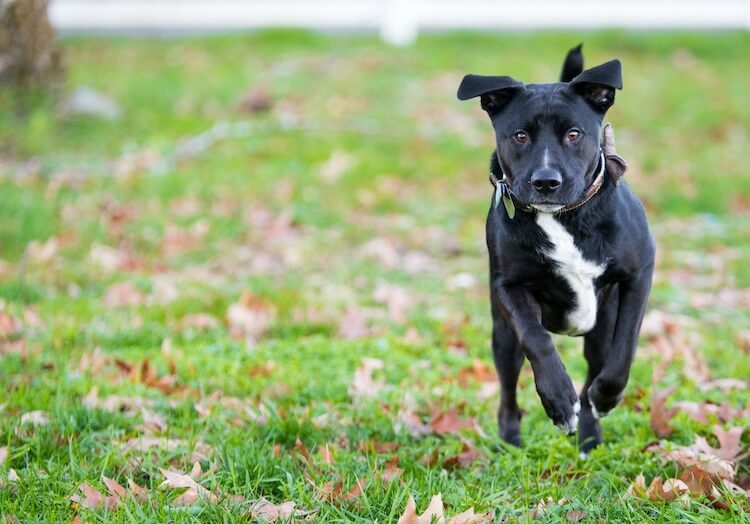 Boxer Lab Mixes are playful and tend to have a boisterous nature. This means they are always up for a game of fetch or tug of war. It may be fun to play hide and seek with your dog; either hiding yourself, food, or your dog’s favourite toy. Labradors are very food motivated dogs, so its not hard to imagine that a Boxador would be too. These dogs respond very well to training as their intelligence, food orientation and devotion to their owner makes them fast learners. It is important to be conscientious when training your Boxer Lab Mix, they respond well to positive reinforcement and poorly to punishment as their dedication to their owners gives them a strong sense of betrayal when scolded. This breed responds very well to clicker training, but the Labrador in them may make them a little dopey. When training, shorter, more frequent sessions will be much more effective than longer, infrequent stints as they may lose interest. Boxadors are known to suffer from separation anxiety due to their loyal and devoted nature. This can be treated when they are young, and training for this should start as soon as they arrive in your home. Leaving your dog for just minutes at a time and slowly building up to longer periods should result in a much happier dog. Lots of positive reinforcement on return, such as verbal praise and play should result in a positive association with you leaving as your dog will learn that you always come back. This dog is known to be a relatively healthy dog. Individually, Boxers and Labradors are known to have a host of potential health concerns such as hip dysplasia and obesity. However, given that the Boxer Lab Mix is a cross they may benefit in hybrid vigor. Like a Shorkie, Boxer dogs are brachycephalic dogs, meaning they have a flatter face. This can cause breathing and temperature regulation problems. However, this problem may be corrected due to the influence of the Labrador. Research at the University of Georgia show cancer is the number one killer of Boxer dogs; with 4 in 10 mature Boxer dogs falling ill to the disease. This is something to watch out for in your Boxador, common symptoms include: lethargy, loss of appetite, difficulty breathing, limping, recurrent digestive problems or weight loss. If you are concerned about any of these symptoms or can feel an unusual lump in your dog it is always best to consult a vet. When adopting or purchasing a puppy, it is important to ask for a health test. The Boxer parent should have a clear heart check, good hip scores, a recent eye test and be declared cancer free. The Labrador parent should also have good hip and elbow scores and recent eye test. Ideally, the puppy should have a note from a vet declaring that they have no breathing problems. You may be able to confirm this yourself, as your dog should not be wheezing as they breathe. Boxadors may be gold, brown, chocolate, brindle or a combination of the above. Some of these dogs may have white markings. As this dog is a crossbreed, it is very hard to guarantee a specific appearance. Each dog will be completely unique, some leaning more towards their Boxer parentage, others leaning more towards their Labrador parentage. Of course, some dogs will be a perfect hybrid. It is near impossible to predict appearance, but it is possible to gauge a general idea. As this dog is a cross between a Boxer and a Labrador, it is on the larger side, weighing between 50 and 80lbs. Boxadors are usually between 21.5 and 25 inches tall. This can vary between the sexes, with females tending to be slightly smaller. They tend to take after their Boxer parents when it comes to coat. They typically have smooth and shiny coats and are unlikely to shed. They have straight fur, and it is usually not wavy or rough. If your dog’s coat takes after their Labrador parent’s coat it may shed seasonally and will require brushing plus bathing; this is much rarer to find amongst this breed. Is the Boxador the ideal dog for you? 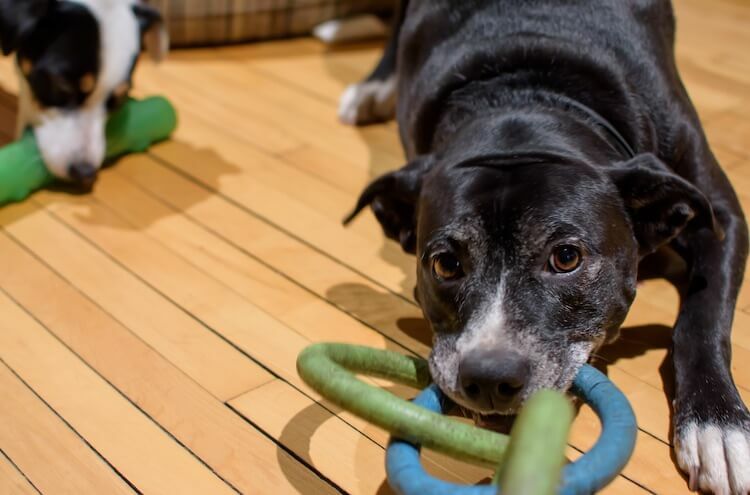 If you are looking for a super active sidekick and a new addition to your growing family, this dog could be a perfect match. Loving and loyal, this dog will blend well into every aspect of your life. Affectionate and obedient, this is the dog for you if you are looking for a new friend to go on long adventures in the country side. These dogs are relatively low maintenance and require relatively infrequent grooming compared to other dog breeds. However, this dog may not be for you if you are inactive, regularly away from the house or unable to manage their diet and potential health issues. Please feel free to leave a comment below with your experience of this mixed breed. I just got a boxador puppy. I am not one to be active at all and I truly do love the fact that she is getting me up and around plus gets my pitbull to play again. The only problem I seem to have is her barking and wining when I put her in her kennel for the night.